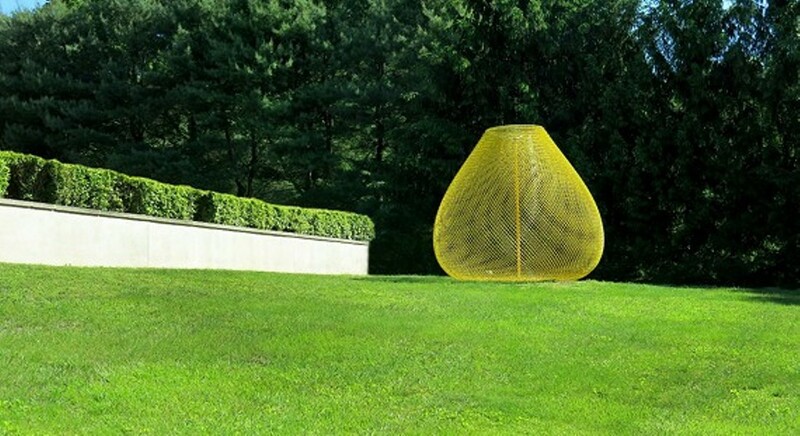 Yellow Orb/Homage to Van Gogh, created by sculptor John Ruppert specifically for the Katonah Museum of Art campus, will be on view on the front lawn of the KMA through May 2015. Ruppert transforms prison-grade chain link fabric into large vessel-like forms. Chain link typically connotes danger and boundaries; it is a commercial product intended to confine, protect, and keep out. The material reflects the urban environs of Ruppert’s Baltimore studio and is one that the artist often employs for his sculptures. The industrial fencing is an unexpected element in the bucolic landscape of the Katonah Museum of Art.